Early this morning a female pedestrian was rushed to the hospital after she was struck by a car at the intersection of west 79th street and Broadway (read more in the New York Daily News). Since the beginning of this year numerous pedestrians have suffered personal injury or lost their life after being struck by vehicles on some of the larger streets on the Upper West Side. West 79th Street is one of the most dangerous streets on the Upper West Side because motorists exiting and entering the Henry Hudson Parkway use this large street. In February 2014, residents of Community Board 7 made a list of the 4 most dangerous intersections on the Upper West Side one of which was Riverside Drive and 79th street. According to NYC Crashmapper, there is an average 3.23 collisions per month at this intersection. This morning’s accident happened two blocks away on the same street at another dangerous intersection. 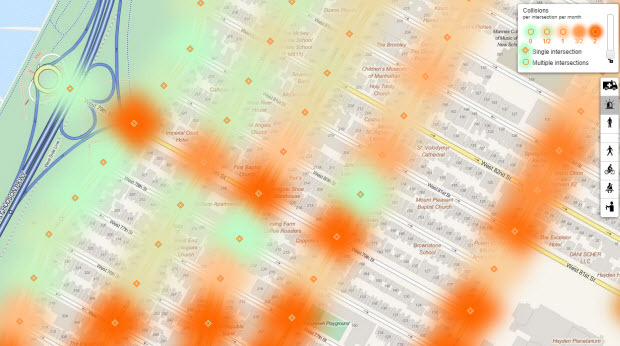 Crashmapper calculated a rate of 2.42 collisions per month at the intersection of Broadway and 79th street. According to the same source between August 2011 and February 2014 there were 75 collisions at this location. 5 pedestrians, 1 bicyclist, 5 passengers and 4 drivers suffered personal injury as a result of these accidents.